In October, 1805 the harbour here in Cadiz held a fleet of 33 great heavily-armed, three-masted French and Spanish warships. 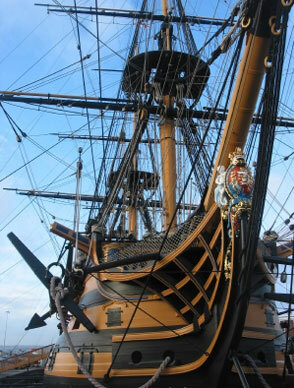 Built of oak, they were very similar in appearance to Nelson's well-known flagship, the Victory, now in Portsmouth harbour. On board were seven Admirals – three French and four Spanish – forty Captains and thousands of officers and men under the overall command of Admiral Pierre Villeneuve in his flagship, the Bucentaire, of the French Navy. It was a very formidable force indeed, and news of its presence in Cadiz harbour thoroughly alarmed both ; for England was at war with France and her ally Spain, and their Lordships of the Admiralty strongly suspected, rightly as it happened, that Villeneuve was under orders from his boss Napoleon to sail north and join forces with a large French fleet at Brest, thereby posing an intolerable threat to British naval superiority in the Channel. In fact, the situation was very like that which faced us in 1940, when we found ourselves alone against a triumphant European superpower just across the Channel and threatened by invasion. Napoleon had built a huge invasion camp near Boulogne, and the one thing he needed to make an invasion possible was naval superiority over the narrow waters of the Channel for long enough to get his army safely across. Meanwhile, the only thing which prevented Admiral Villeneuve from obeying his Emperor's orders was the sight of some British frigates on the horizon over there keeping watch on him and his fleet, and the knowledge that somewhere out of sight behind them a large British fleet was waiting with hostile intent for him to sail. As a result, Villeneuve called a conference of his fellow Admirals and senior officers to discuss what to do, and after weighting the pros and cons decided to stay where he was. The risk involved in leaving port was too great. However, when the news of his inaction reached France, Napoleon was furious. “Where did my Admirals learn that they can make war without taking risks?” he cried in a rage. Needless to say, London knew none of this, and was as determined as ever to prevent Admiral Villeneuve from joining his fellow countrymen in Brest; and the obvious man to do so was Admiral Lord Nelson of the Nile and Burnham Thorpe, as he then was. Nelson was forty-seven. Hugely popular with the public and all ranks in the Navy, with the exception of a few senior officers who were jealous of his meteoric rise. Had he been French, Napoleon would have loved him; for he revelled in taking risks – albeit calculated ones – courting battle whenever possible, and nearly always winning it. He had been wounded several times, losing an eye in a abortive landing on Corsica, his right arm in an action near Tenerife, and suffering a bad scalp wound during the Battle of the Nile in Aboukir Bay, when he had annihilated a French fleet without losing a single British ship. Incidentally, when news of the victory in Aboukir Bay reached London, Lord Spenser, the Fist Lord of the Admiralty at the time, and presumably Princess Diana's great, great, great something or other fell fainting in the corridor outside his room in the Admiralty. As a result of all this – his courage, his readiness to share danger with his men, and his talent for leading them to victory after victory – they loved him. Nelson was appointed to command the fleet outside Cadiz by the Prime Minister, William Pitt. As a result, in early September he took the night coach to Portsmouth, had breakfast at the George Inn, and after lunch made his way to the beach, people crowding round him, cheering, weeping, kneeling – even kissing his hand as he passed. “I had their cheers before,” he said to Hardy, as they were rowed out from the shore, “Now I have their hearts.” The next morning, the Victory weighed anchor, and on 28 September, 1805 Nelson joined his ships outside Cadiz harbour, taking over command and beginning to wait as patiently as he could – he was not a patient man – for any sign of movement by Villeneuve. It came sooner than might have been expected and for a rather discreditable reason. For while Villeneuve had decided not to risk a battle when, by doing so, he might have helped his country's cause, when rumours reached him that he was to be relieved of his command by a certain Admiral Rosilly, who was already on his way from Paris, and that he himself was to go and explain his conduct to the Emperor, Villeneuve gave orders to sail rather than wait Rosilly's arrival. When the news reached Nelson through his chain of look-outs at half-past nine on the morning of the 19th October that the combined French and Spanish fleet was coming out of harbour, he made the signal to chase, and there was huge excitement as each ship went off at its best speed. While waiting for this moment, all the Captains had been briefed by Nelson as to exactly what to do, when it should arrive. For over a hundred years, there had been one unquestioned rule governing the way to fight a battle at sea; the contending ships should form lines opposite each other – hence the terms 'line of battle' and 'ships of the line' – and then blaze away at each other with broadside after broadside until one side was so badly damaged that it had to surrender or break away in an attempt to salvage as many ships and men as possible from the wreckage. No one dreamed of questioning this procedure. It was as sacred and immutable as one of the laws of the Medes and Persians in biblical days. But Nelson had not only already questioned it, he had won his most brilliant victories by doing so, and intended to ignore it again this time With thirty-three ships of the line under his command, Villeneuve was numerically superior to Nelson with only twenty-seven, but Nelson's tactics were to divide his fleet into two columns, both of which would sail head-on towards Villeneuve's line of battle, one column concentrating in superior numbers on the ships of the enemy's rear, while he himself in the other would drive through the enemy centre and prevent their ships of the van from coming to the aid of the ships in the rear. Once the fighting began, Nelson told his Captains, they would have to use their own initiative, for the smoke and reek of battle, the deafening noise of the guns, the whistling of round shot through the rigging, the crashing of masts to the deck, the splintering of timber, the screams of the wounded and the shouts of men in the general melee would make it impossible for signals to be seen. Each Captain would be on his own, but – he told them, “No Captain can do very wrong if he places his ship alongside that of any enemy.” All this they knew. You all know the rest. At a few minutes to noon, a ripple of flashes and puffs of white smoke – a broadside from the French ship Fougeux – opened the battle, and as if by mutual agreement the ships of both fleets ran up their colours and battle flags. Nelson was on the quarter deck of the Victory with Hardy, when it came under heavy fire, its masts and rigging being shot to pieces; his secretary, John Scott, was killed by a round shot, and some marines on the poop deck were cut down by a chain shot, while a moment later another round shot crashed into the mizzen mast near Nelson and Hardy, though neither was hurt. “It is too warm work to last long,” Nelson remarked; but an hour later, they were still there pacing up and down, while all around them ships, their decks slippery with blood, were locked together in an inferno of noise and smoke. But at a quarter past one Hardy turned to see Nelson on his knees, supporting himself with the fingers of his left hand. He had been hit by a bullet, which had pierced his shoulder, severed an artery in one of his lungs, and lodged in his spine. Hardy knelt beside him as a sergeant-major of Marines lifted him up. “They have done for me at last, Hardy,” he told him. “My backbone is shot through.” Taken below, where in the gloom the surgeons were busy with forty wounded and dying men, Nelson wouldn't allow them to leave them, for he knew that there was nothing they could do for him. His time was short, but he longed to know how the battle was going before he died. He sent message after message to Hardy to come down and see him, and was anguished when he didn't come. But Hardy was busy repelling a boarding party of Frenchmen, and the outcome of the battle was still unsettled; but by half-past four it was nearly over. Coming down and holding Nelson's cold hand, Hardy told him that he had won a brilliant victory. “How many of the enemy have struck?” Nelson asked, Hardy replied that he could answer for fifteen. “That is well,” Nelson whispered, “but I had bargained for twenty.” The end came very soon after. The firing was over by 4.50 p.m. And as the log of the Victory recorded, 'Admiral Lord Nelson died of his wound'. His body was brought back to England in a barrel of brandy, and was buried in St. Paul's Cathedral, while the country mourned his death and tried to understand the magnitude of the victory he had won. The British had lost no ships, but seventeen hundred men had been killed or wounded. The French and Spanish had lost eighteen ships destroyed or captured, and nearly six thousand men had been killed or wounded, while twenty thousand had been taken prisoner, including Admiral Villeneuve. In the short term, Nelson's victory destroyed for ever Napoleon's hope of invading England, and started him off on the road, which led him eventually to Moscow, Waterloo, exile and a lonely death on the island of St. Helena. In the slightly longer term, it led to the unquestioned dominance of the Royal Navy over the oceans of the world, for at least a hundred years: a dominance which made possible the astonishing British imperial and colonial expansion of the nineteenth century. But in the longest term of all perhaps the most lasting and surprising result of Nelson's victory at Trafalgar was not the expansion of the British Empire in Victorian days, but that of the English language, which went with it; so that, today, it is the world's second language. And that seems to me to put his victory at Trafalgar on a par with that of Alexander the Great at Persepolis, which resulted in Greek becoming the lingua franca of the Hellenistic world for centuries, and the victories of Julius Caesar which did much the same for Latin in our own mediaeval western world. If I am right, then Horatio Nelson, the parson's son from Burnham Thorpe, richly deserves the stand as high as he does over London's Trafalgar Square.